OctaFX Supercharged real contest moves in a high gear. We continue our regular prize giveaways and reward our winners for their outstanding trading performance. We are excited to grant iPhone 6 to Mr Mohd Najid Bin Abu Bakar from Malaysia. The result of our Round 8 winner is unbeatable so far! We encourage the traders to take part in the contest and show what they are capable of. Meanwhile, we want to share the success story of the winner of Round 8. I am aiming at improving my trading skills and competing for the 10 top-notch prizes. Participation in the OctaFX Supercharged real contest is a great opportunity to receive amazing prizes, and I will do my best to win them! Besides that, the contest is a great tool to learn and develop my own trading style. I have learnt a lot of useful skills that helped me to become a mature trader. It is essential not to be greedy and to control emotions. Otherwise you will fail. But also try to be highly involved in the trading process. I was very focused while participating in Round 8, and it allowed me to win. 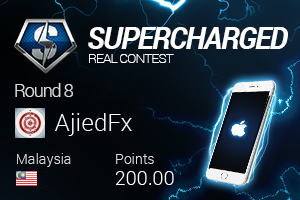 Round 8 OctaFX Supercharged real contest was the most successful trade for me so far. Personally, I use moving average and bollinger bands while trading. I have applied both of these indicators in Round 8! Frankly, it took me 5 years to develop my trading skills and to learn the whole process. You need time to gain necessary experience and turned into a really good trader. We thank Mr Mohd Najid Bin Abu Bakar for telling his success story. Our winner receives his brand-new iPhone 6, which will soon reach Malaysia! Every trader is welcomed to take part in OctaFX Supercharged real contest and compete for our 10 top-notch prizes including Tesla Model S, Smart Fortwo and Renault Twizy! We are delighted to announce the results of our OctaFX Champion demo contest and greet all the winners of the legendary competition.